Modifying your TQ/IT experience since day one! Modify your game in a snap! TQ Defiler/TQ Portable makes character editing easy and allows you to make other changes. Put those relics in purple and blue items! Edit your character by modifying stats, skills, waypoints, and other attributes. If you used this program and it helped you, please consider a donation to keep this site up! Welcome to SoulSeekkor's TQ Defiler website! New TQ Defiler.NET 1.3.9 released! Minor fixes. Mailer/Reporting tool now works again! New TQ Defiler.NET 1.3.7 released! New TQ Vault 2.3.1.4 posted! Updated various links. Want to help make Grim Dawn the greatest game it can be? Please consider contributing via Kickstarter here. Current pre-orders also give credit towards higher tiers, and there are some nice rewards! Haven't heard of Titan Quest's spirtual successor yet? Click to go to http://www.grimdawn.com! Former Iron Lore Lead Designer and others have formed Crate Entertainment, and currently have a Titan Quest engine-based game in development that's looking great so far! The website also has its own forums where the TQ community and game creators post, so dive in! This is the home of SoulSeekkor’s TQ Defiler and TQ Portable...not much right now but I’ll work on it as time comes to me! This program is designed for all versions of Titan Quest and Immortal Throne (including versions 1.01, 1.08, 1.11, 1.15, 1.20, and 1.30 of Titan Quest and version 1.10 of Immortal Throne). It can be used for many purposes including character editing or testing and for many built-in game modifications including infinite potion stacking and relics in uniques among many others. Click here to view the downloads page. 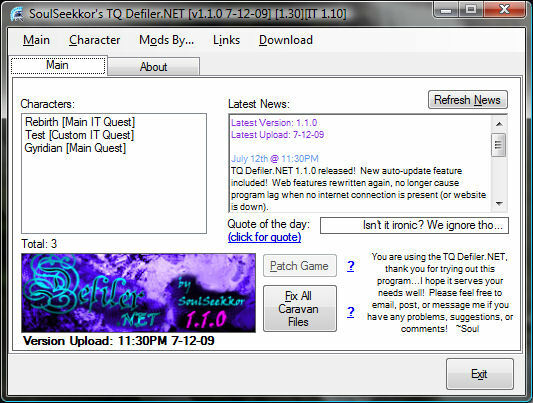 [6/29/14] TQ Defiler.NET 1.3.9 released! Minor fixes, mailer/reporting tool works again. Patcher fixes and Bman's 'Show All Damage' mod for IT fixed. Many fixes, including to the auto-backup feature and fix all caravan files feature. Also added a new fix mod by The Lord of Space, 'Slow Cast Bug Fix' fixes casting slowdown issues caused by the game incorrectly updating animation times. This version has a number of fixes done from errors that were reported, thanks to those who took the time to submit an error report! This version has had every function in the Defiler's source revamped to use the new reporting tool, other various improvements have been made. Made adjustments to Raven's mods (TQ/IT) to fix the limit of 50 issue. Also added a new Mailer Tool to the program, used both for instantly emailing me comments or suggestions as well as automatic bug reporting. This can be found via the 'Mailer Tool...' menu. Various fixes as well as a new mod added. Various fixes and addition of the inventory tab for testing purposes. Changing skills levels were only making changes to memory, not to the save, this has been fixed. Added EJFudd's random number generator fix to the Defiler (as a mod) for IT. Fixes loot drop issues due to issues with the game's RNG function. Also included Rick's fix for those who get socket error messages when refreshing the multiplayer games list. Fixed issues with removal and restoration of the Dream mastery as well as any other skills using expansion database records. [7/4/09] TQ Defiler 3.4.5 has been permanently removed. The time has come to completely remove any further support for the old TQ Defiler 3.4.5. This program has been outdated for an extremely long time, hasn't been updated and falls short of the newest TQ Defiler.NET in so many ways (not to mention the toolset used to create the program isn't even supported anymore). I'll still answer questions for those who have them with the program, but for many those problems can be solved by downloading the .NET version and your response will be "Please download the latest Defiler.NET. ", you have been warned! I'm on the verge of releasing TQ Defiler.NET 1.0.6, I probably won't be able to wait for the last piece I wanted to include, so it'll be coming soon after some TQ Vault testing. Immortal Throne Community Fanpatch 1.17a released! This community created patch fixes many of the known bugs found within Titan Quest (Immortal Throne only!). Highly recommended if you love TQ. :) Can be found on the downloads page! TQ Vault 2.20 just released! Many updates and fixes for functionality, copy/move tabs and more! Check the downloads page! Fixes similar issues with D2D/Steam versions of Titan Quest causing overflow errors with the mods most recently fixed in the latest Defiler.NET. Also includes a new setup version, when using this remember to install directly to the game's folder! If you wish to use it with both IT and regular TQ you'll need to install again or copy the program and Interop.Scripting.dll file to the other game folder.